It is easily the most painful part of the employment process. The case law of employment claims is ripe with horrible stories of terminations gone wrong. Take as much time to fire as you did to hire. The employer who decides to fire someone at 3 pm on Friday is making a terrible mistake. Never fire in a hurry, especially when you are angry. Take your time and plan both the firing decision and the means to do it. Document performance to support the decision. Hopefully you have good documentation procedures in place already and have given the employee evaluations and warnings that the performance is sub par or that there is some other business reason for the termination. Always tell the truth. If the termination is not for cause but because of a downsizing, then do not make up other reasons, tell the employee you have to downsize. However, if the reason given is that there is a downsizing, make sure that you are not looking to fill the position in the near future. Fire the employee for what they admit to have done, not what is speculated to have happened. In almost every for cause termination situation there are facts that the employee admits which are sufficient to justify the action. Use those as the reason for the termination, not what is suspected. For example, the bank teller who admits that she failed to count the money before placing it in the bag will be fired for that and not for theft of the money which she adamantly denies. Use a team to deliver the news. The team should consist of a person with authority to make the decision and one who can handle the details of the exit. It is often advisable to have a male-female team to handle the matter. 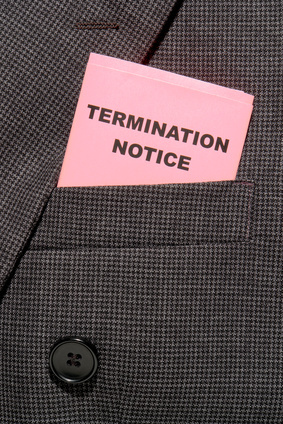 Consider using a termination letter. Indiana law requires a written reason be given for any termination. Moreover, the exit interview can be eased substantially by the use of a termination letter. The letter can set out a general reason for the action, and handle the details of the termination with an increased degree of professionalism. Handle the money well. Know how much the employee is owed for wages, vacation, commissions, etc. By handing the fired employee an envelope with a check in the appropriate amount at the termination, you will substantially reduce the chances for lawsuit by a disgruntled employee. Terminate in a neutral site such as a board room or conference room. Besides being more fair to the discharged employee, the neutral site is more flexible than the president’s office. The terminated employee may want to go over every detail of removing each knick-knack from the office or go over other details that the company president doesn’t need to remain to discuss. By using the neutral site, these situations can be avoided. Shut up. Termination interviews can be ruined by poorly stated oral presentations. You have labored over this letter which the employee is trying to read, so let them do so. The best terminations are when the employee reads the letter, shakes your hand and walks out the door, nothing more to be said. Don’t ruin it by talking too much. Also, don’t engage in debate. The decision has been made and there is no reason to continue a discussion on the point. Consider a severance package. Many employees are looking for a package consisting of severance and other benefits. If you are willing to pay more than two severance, you should have an employment attorney draft a complete severance and release agreement which complies with the Older Workers Benefit Protection Act. In the long run, you may save a lot of time and money by providing a severance package. Remind the employee of any obligations to the company. In many states, including Indiana, covenants not to compete are enforceable even against employees who have been fired. Also, many employees know confidential trade secrets belonging to the company and they may not realize the liability they face for misappropriating those. It is good practice to remind employees of their obligations in the terminations letter. Post-termination considerations. Do not follow all of these suggestions and then screw up the entire matter after the fact. Be aware that post-termination defamation and discrimination claims can be very expensive. Keep the circumstances of the termination confidential and instruct all others to do the same. Firing an employee is, without question, the hardest part of management. However, by following these guidelines you might find what you thought would be a difficult termination, turns out to be as harmless as a visit to the dentist — with no cavities. Mark R. Waterfill is an attorney with Benesch Attorneys, an Indianapolis-based law firm. Mark can be reached at (317) 632-3232 or by e-mail at mwaterfill@beneschlaw.com.